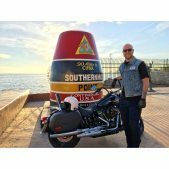 One route I’ve always wanted to ride was Miami to Key West. After researching that route I noticed on the map when crossing into the Keys, there’s a second option to Highway 1 called 905A, also known as Card Sound Rd. Card Sound Rd is a small remote two lane road until it hooks back up with Highway 1 in Key Largo. 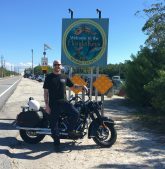 After finishing business with a couple days left before heading back to Minnesota, I picked up the bike in Miami, paid the extra for the toll pass (which is critical when going anywhere in Florida) and headed down. Card Sound Road peels off Highway 1 with a forgettable and easily missed left turn. After turning onto Card Sound Rd, the road is straighter than an arrow with very few side roads feeding into it thats perfect to get the city out of your head. Lunch time had rolled around, and there is no better spot to stop, have a bite and get into the lifestyle of the Keys than Alabama Jacks on 905A, Card Sound Rd. It’s a roadhouse style bar and seafood shack serving up tasty plates. The conch fritters are legendary as are the fish tacos and while I was there they even had live music going. After leaving Alabama Jacks, it’s a short hop over to North Key Largo to make the right to continue onto 905 and eventually hook up with Highway 1. Heading south out of Key Largo, you’ll go through Plantation Key, Islamorada, across bridges that overlook the water and boat docks eventually heading into Marathon Key. It is a relaxing, stop as you go, whatever floats your boat type of ride with multiple shopping, restaurant and tourist options. After Marathon Key is the famous “Seven Mile Bridge” that offers the most stunning views of the ride due to the elevation of the bridge that allows boat traffic underneath it. A word of warning though, the winds can get pushy if you are not used to riding in cross winds. The two lane, no median bridge may be intimidating to a beginning rider. Throttling into Big Pine Key, you will be riding through the National Key Deer Refuge so keep a sharp eye for jumpy deer trying to cross the road. I, luckily, did not see any but I’ve heard they are there. From there it was a gorgeous island hopping ride into Key West, and if you time it right, its quite stunning at sundown. With little daylight left, I headed straight for the Southernmost Point in the Continental US for a photo before heading out for dinner and drinks. Conch Republic Seafood Company was the call with a fantastic lobster dinner. It has a very casual island atmosphere with food that rivals the best. Last call went down at Hogs Breath which is a legend in its own right and had a killer band playing to the wee hours of the morning. On the tourist side, I enjoyed visiting Ernest Hemingway’s house, Key West Shipwreck Museum, a distillery tour at Key West First Legal Rum, and fried plantains with some live music at El Meson De Pepes. Heading out it was a straight shot up Highway 1 and actually found the views heading south to north beat the views heading north to south. I’m still not sure if it was because the view was actually better or if Key West had lulled me into a calm mindset from the craziness that Miami had created. One last pit stop for lunch in the Keys was at biker bar and grill Hog Heaven in Islamorada for some great BBQ. They have an awesome back patio with a stage and a few boat slips that overlooks the gulf and is the perfect send off to leave the Keys on. Crossing back into the mainland I stayed on Highway 1 instead of getting on Card Sound Rd. It has a few views that are also pretty great and make it worth hitting either on the way down or on the way back. 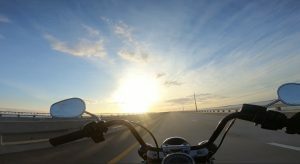 If you ever have the chance to head down to the Keys, there is no other way to do it than in the seat of a Harley Davidson. Until next time, ride safe, wrench safe, and we’ll see you on the road. Please stop by our sponsors Gatorz and Harley-Davidson Footwear to learn more. Great discribtion of the travel sounds like my trip started in Daytona .